AUBURN, Ala. – No. 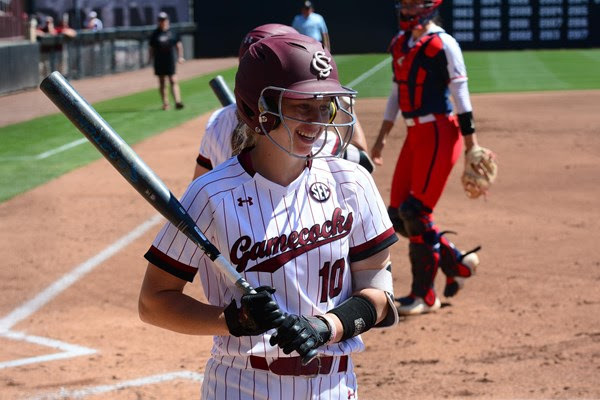 16 South Carolina softball responded in a big way with a 10-1 victory in five innings over No. 12 Auburn on Saturday at Jane B. Moore Field. The Gamecocks blasted two home runs as every player in the starting lineup reached base to help Carolina tie the series at 1-1. This marked the first time since 2017 the Tigers allowed 10 or more runs at home and was Carolina’s first SEC run-rule victory this season. The victory was the Gamecocks’ first in Auburn since 2013. The Gamecocks improved to 6-11 against ranked opponents and went to 6-10 in conference games while Auburn fell to 9-5 in SEC play. South Carolina (30-12, 6-10 SEC) came out of the gate swinging following a tough Friday night loss. Carolina loaded the bases with two outs in the first inning before Alyssa Kumiyama cleared the bases with a double to give the road squad an early 3-0 lead through one. The scoring continued in the second with a bang as Jana Johns blasted a no-doubter over the wall in left to extend the lead to 5-0 through two. But the Gamecocks weren’t done there as they posted four more runs in the third. Two walks with bases loaded before Mackenzie Boesel plated a run extended the Carolina lead to 9-0 through three. Cayla Drotar helped her own cause in the fourth as she hit a ball to right off the right fielder’s glove that eventually bounced over the wall for the Gamecocks’ second homer of the day to push the lead to 10-0 over the Tigers. Auburn (33-9, 9-5) showed some fight with a single run in the bottom of the fourth but it wasn’t enough as the Gamecocks shut the door in the bottom of the fifth with a commanding run-rule victory. Drotar (7-5) went the distance allowing just four hits on 19 batters faced. Johns led the way at the plate going 2-for-3 with three RBI and two runs scored. Kumiyama had three RBI, as well. With the win today, Carolina earned its first SEC run-rule victory since a 15-5 win over Tennessee last season. The Gamecocks blasted two home runs in the win. That marks the 15th time this year the squad has hit two or more in a game and the second time in SEC play. With two home runs, South Carolina now has 53 on the year. That’s tied for the second most in school history for a season. Carolina improved to 4-2 in SEC Saturday games with the Auburn victory. The Gamecocks are 2-3 in Sunday conference contests thus far. Carolina has now won 30 games in a year for the seventh-straight season under head coach Beverly Smith.